Bob and I walked along. I decided to carry the little .410 shotgun and, possibly, get a couple of squirrels. Bob was hunting deer with his flintlock. I saw a squirrel in the gray, dismal morning light, but elected not to take it for we were walking in a deer bedding hotspot. Bob went to a favorite place to watch as I walked around forgetting to watch for squirrels. I peered over an embankment only to watch a red fox easing through the brush. Later, I walked onto four gobblers. 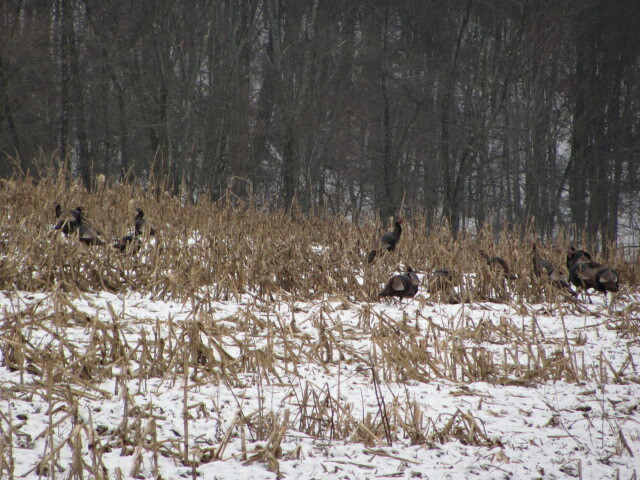 I was wondering why we hasn’t seen any turkey or turkey sign just prior to seeing them. Later I would see more turkeys. We saw three more deer while leaving. The deer were at an exact same place where I managed a photo last week. Something there attracts them , but they are easy to spot. After repairs and corrections were made the two of us enjoyed mom’s home cooking! Nice post Larry. It’s nice to read about hunting experiences in other parts of the country. I hunt whitetail in New Brunswick, Canada, and I can tell you I don’t see as many deer in a season as you guy’s saw in one day. I use a 308 Savage Rifle handed down from my mother in-law’s uncle. I never hunted with a muzzle gun, but I know that hunting laws or techniques sometimes require this type of hunting. Maybe one day I will try a hunt turkey. There are no wild turkeys home, but from what I read, it is a great adventure. My sons hunt with me now and we too enjoy some of my wife’s home cooking after each hunt. 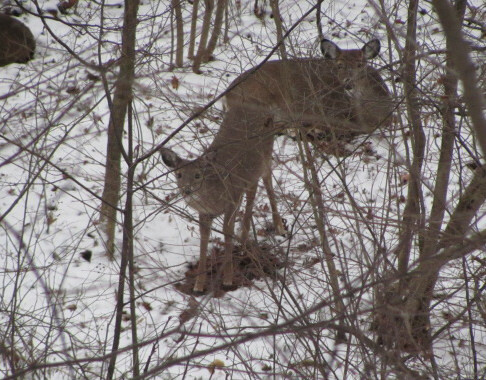 You can go to my website to see my 2011 Whitetail Season’s Success.